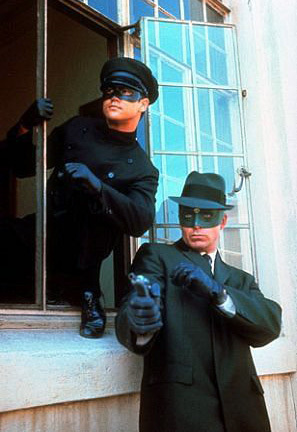 Hero Histories: Video Fridays: THE GREEN HORNET in "The Ray is For Killing"
Video Fridays: THE GREEN HORNET in "The Ray is For Killing"
NOTE: Fixed the YouTube links to provide bigger images. The Green Hornet and Kato face art thieves armed with a laser rifle! Except for the two-part series finale, "Invasion from Outer Space", this was the most outlandish episode of the series. Usually, the show was a straight "detectives with masks" format, dealing with gangsters, extortionists, etc. No super-weapons (except The Hornet's, of course). Curiously, there's no explanation as to how these criminals got their hands on a laser, who taught them how to use it (or who's gonna fix it if it breaks), or why they're not using it for more lucrative crimes. We don't know who built the laser. These guys didn't have the scientific background to do so. Was there a mad scientist running around the city? Why didn't The Hornet take the laser and incorporate it into his weaponry? As it is, leaving it for the police left open the possibility that they could adapt it and use it against him and Kato! The laser itself is shown to be powered by simply plugging it into an electrical outlet! 110 or 220 volts? It also conveniently fits into a suitcase. There's location shooting in the Los Angeles storm drain system, both inside the tunnels (where the Black Beauty's green headlights really glow with an eerie effect unseen any other time in the series), and outside using some of the same viaducts seen in Terminator 2 and THEM . Though it's the ninth episode aired, this was the second episode shot, after "Programmed for Death". We're using a new YouTube provider, HornetNest1000, so you'll notice a slight difference in the openings of the individual segments, though the picture and sound quality are equal to Michelle66's work.